The End is Nigh.. Or Not.. Who Knows? I met an anti smoker today while I was out with the dogs. I meet them, I suppose, every day, but this one gave me some astonishing news. "That will kill you." she said. "Smoking. It will kill you." I drew on my pipe, hard and long, and blew smoke at her. "It will kill you. It shortens your life." "I see." I said. "So if I didn’t smoke, I would live for ever?" "No. But you won’t live as long as you should." "And how long should I live? I asked. "Tell me, when am I going to die?" "Then how can you state that I am going to live longer, or shorter, than something that you know nothing of?" I was getting ready for the usual tirade. "Do you know how I am going to die?" "Then how can you be sure that smoking my pipe will shorten my life? Will the bus that is destined to run me over be early that day because I smoke? See, I’d love to know when and how I will die. Then I can make some real plans as to how I am going to spend the rest of my time here. Until then, I’ll just enjoy what I can, while I can. Which includes smoking my pipe." "But it’s bad for you." "Really? Then explain to me why pipe smokers appear to live longer than their non smoking contemporaries. Why is the percentage higher among non smokers than smokers where Alzheimers is concerned? Why are pipe smokers generally less troubled by these so called stress related diseases? And while we’re about it, show me one death certificate that states cause of death as being "Smoking". There isn’t one. People do not die from smoking. They die of diseases that may be aggravated by it, but the disease itself is the killer. Or was none of that mentioned in the last piece of so called hard evidence that you read and draw your conclusions from? My thanks for your concern Madame, but it really is wasted here." I called the dogs to me and walked off leaving her to consider my argument. If we were all given a set number of days to live then I could understand any math involved. But we aren’t. We are not guaranteed a certain length of life. So how can anybody be sure that anything we do will lengthen or shorten our time on this earth? We do not all die of old age. Some of us die in traffic, accidents at work, war, natural disasters. So even the manner of our demise is not guaranteed and is unknown to us. To assume then, that my life will be shortened or not by any activity I choose to indulge in is purely hypothetical as there is no end point to measure backwards from. Mountaineering is equally as potentially dangerous. So is hang gliding. Driving. Or even just going to work and back each day. Working for fifty years will damage your health. You don’t see any feckin’ government health warnings there though, do you? Life is ultimately only terminable. I will die one day. That is inevitable. I am not worried about it, because once it is done with, I will know nothing about it. Unfortunately, I do not have a "Due by" date stamped on my arse. On the other hand, if I was to spend the rest of my days worrying about it, it would be a pretty miserable life anyway. I want quality while I can get it. Not quantity at any price. We had a bit of fun at work today. It started out seriously enough in that we needed to take measurements of a crate due for shipment. For some strange and inexplicable reason, the team’s tape rule was nowhere to be found. One of my guys, being the helpful type spoke up saying not to worry, he had an ordinary tape measure that he uses for his photography hobby somewhere in his bag. He usually carries his camera with him everywhere. Ok then, out with it and on with the job. Job done, measurements duly noted and paperwork sorted out, we returned to our normal working activity. On a Thursday, that usually isn’t too strenuous as the first three days of the week are hell on earth and we can generally take a bit of a breather by the fourth. And so it began. We now had a tape measure to play with. And play we did. We measured our arms, both for length and girth. Then our legs. Across our shoulders and from earhole to earhole over the tops of the heads. Our noses. The distance between our eyes. Circumference of our heads. The spread of our hands. There eventually had to be a little competition involved so we measured each other for reach from finger tip to finger tip while standing in the crucifix position. And then the same from toe tip to toe tip. It’s amazing just how far one can spread ones legs without actually doing the splits. We were giggling like schoolgirls. Finally, of course, we measured waist and chest. It was then that I found out that my body has reached absolute and perfect harmony. This was a bit of revelation but, as I have always regarded myself as being a harmonic type, I was neither shocked nor bothered by the final confirmation. How have I achieved this absolute zen condition? Well, it’s very simple really. I weigh 110 kilograms and my waist measures 110 cm. I am, metrically speaking, perfection personified. I am, in some strange way, as heavy as I am round. Dali Lama, beware. About a month ago my dear lady wife came home with the bad news. Her old car had failed the bi-annual safety inspection. The front end is rotten with rust. Or at least, the chassis is. It could be repaired but that would be more expensive than the old Nissan is worth. A shame really. She inherited the Nissan from her father who was about to buy a new car just as her last old clunker gave up the ghost. That was only fourteen months ago. With hanging head she told her father that the old car was a goner and that she would have to find something else. Such is life. We’ve been here before. My wife doesn’t really need a big shiny new car. She drives about 5 kilometres a day and occasionally she shoots off to the supermarket or wherever. We decided that she needed a car in the first place simply because the short trip from home to work in the winter is so cold and wet that she normally ends up with chronic sinusitis and head colds that would kill a lesser being. There is no doubt that the protection a car affords her has worked. Something had to be done. We started looking at the used car market. No more than ten years old and newly inspected. There are many. Some in excellent condition. All are affordable to a certain degree. Prices, as they say, vary. We were looking at anything reasonable. Then she came up with the big one. “I can get a new car for the same price as some of those we’ve been looking at.” she said. “There’s a recession going on. Cars from last year are cheaper now.” And guess what? She’s right. The automobile business is having a hard time of it here. We have a little saved up and half of it is hers. She earns a good wage. She deserves a new car. “Go for it!” I said. No sooner said than done. I followed her to the dealership to see how this would go. She found a vehicle she liked. She spoke to the salesman. I hovered in the near vicinity to see who would take whom for a ride, and I don’t necessarily mean the test drive! My wife is pretty shrewd woman. She didn’t just get the car with the guarantee. Oh no. She got rust proofing and the “care package” thrown in. The care package is a nano-treatment of the paint job. Kind of seals it. And finally “Go faster” stripes that give that sporty look will have to be applied, at no extra cost. 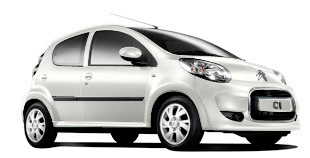 And so it was that my wife became the owner of a brand new Citroen C1 Prestige. The baby of the family. More than big enough for her needs. She arranged the financing, figured out the deposit she wants to make and is altogether happy with the deal. So am I. So now she has to wait fourteen days for the car to be delivered. Until then the old one will have to rise up to the challenge. I’m sure it will. The next time I need a new car, she’s coming with me!